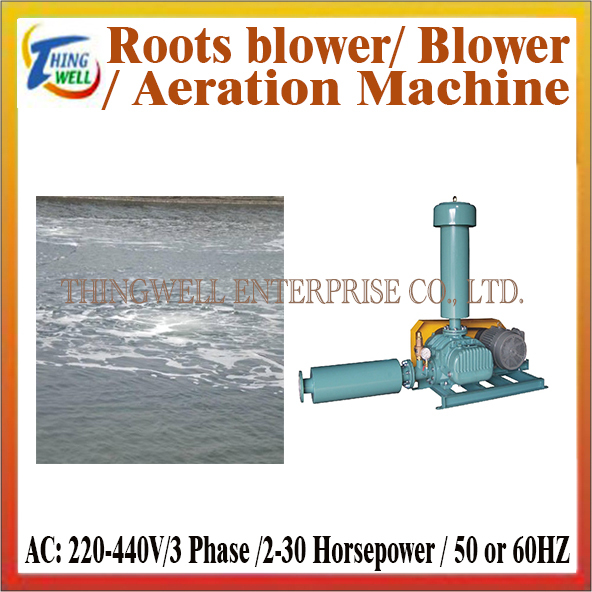 Blowers, Aerator, Roche blower, Aquaculture aerator,-Aquaculture supplies related categories-Thingwell Enterprise Co., Ltd.
Three Lobes reduce vibration and noise. Model : THW series ( Pressure Type ). FOR JET three lobes blowers are new series roots type blower. By CNC machine, we made precise rotors to promote performance, lower noise and vibration. 1)Lower Energy Consumption : Three lobes design control backflow pressure to rotor so reduce energy consumption. 2)Lower Noise : Pressure pluses are the major noise source of blower, three lobes design can efficiently reduce noise by approximately 5 dB. 3)Longer Bearing Life : Less vibration transmitted through the lobe results approximately 20% longer bearing life. ◆Stable air flow and less pressure variation. ●Clean air not with oil moist. ★Construction simple and easy maintenance. ※Bearings are all lubricated by oil moist. Power: 2 / 3 / 5 / 7.5 / 10 / 15 / 20 HP (please specify). (The outlet can choose to add muffler). The motor uses well-known brands: East yuan or Datong. Other parts Made in Taiwan.